Some Vermont farmers lobby for their interests at the Statehouse. Others go there and make the laws. As a member of the House Ag Committee, Independent State Representative Will Stevens is writing bills to ensure the state's agricultural viability. He doesn't rely on research to assess the challenges of local farming, though — he lives them. After "legislating" all day, he goes home to Golden Russet Farm in Shoreham, where he and his wife Judy sell seedlings from their greenhouses. They also vend veggies at the weekly Middlebury Farmers' Market and offer shares in community-supported agriculture. On a recent afternoon, locals young and old wander through the Stevenses' shed after a sudden rainstorm has put the kibosh on afternoon planting. Stevens, wearing a pale yellow T-shirt that says "I Play in the Dirt," greets folks by name and makes small talk as customers gather up bunches of spinach and vibrant heads of lettuce. One young woman asks for advice on cooking with slender garlic scapes, or tops. Stevens' tip: Treat them like scallions. When it comes to local food production, the tanned and mustachioed 52-year-old has always been ahead of the curve. After he graduated from the University of Vermont in 1985, Stevens relates, "Judy was doing some weaving and I was doing some blacksmithing. We decided that growing food would keep us in good stead longer than crafts and producing widgets." Friends in Monkton asked if the Stevens wanted to garden on their land. They did. Just a few years later, in 1987, the couple pursued an early form of organic certification through a group called Vermont Organic Farmers — the certification arm of NOFA Vermont — making Golden Russet one of the first such farms in the area. Stevens even helped VOF write its organic by-laws. In 1996, years before the average Vermonter became familiar with the concept of a CSA, the couple offered one. Nowadays, Vermont is sprinkled liberally with organic farms that wear their certification as a badge of pride — and a guarantee of value. But when Golden Russet got started in the '80s, Stevens says, he actually declined to label his organic produce as such. "Back in the day," he explains, "organic was an excuse for wormy cabbage. If the quality wasn't good, you called it organic." It wasn't until they'd built up a steady clientele that the Stevenses felt "it was OK to come out of the closet" about their methods, he recalls. Even then, getting "certified" was a hassle. Why did the Stevenses decide to farm that way in the first place? "I think I wanted to be accountable for my practices, and I didn't want to apologize to anybody for anything," he muses. "We're feeding our neighbors . . . It seemed like the right thing to do." Wary of government research and recommendations for pesticide use and "suspicious of corporate control," Stevens was also profoundly influenced by the work of German economist E.F. Schumacher, who touted environmentalism and sustainable development in his 1973 tome Small Is Beautiful. In 1997, the farm briefly lost its organic certification when an herbicide spray used by a neighboring farm drifted onto the Stevenses property. For Stevens, the incident underscored the value of organic certification. "By being certified, it really allowed us to validate our claim," he says of the insurance process. Today, the trend toward organic foods — even at huge corporations like Wal-Mart — and the growing localvore movement bear out the couple's choices and ag experiences. Buzzwords such as "sustainability," "seasonality," "peak oil" and "petroleum inputs" have become commonplace in discussions about what's for dinner. As for the cabbage at Golden Russet, it looks just fine. "Pest avoidance is something you can practice on a farm," Stevens explains. The key: understanding the life cycles of damaging insects and how to keep their favorite crops out of the way. "We squished a lot of potato bugs, too," Stevens recalls. The CSA came about when the farm lost a big wholesale client. Moving away from a traditional business model just made sense, according to Stevens. "Instead of putting all our faith and trust in one person, we could spread that over a number of households at $200 apiece," he explains. 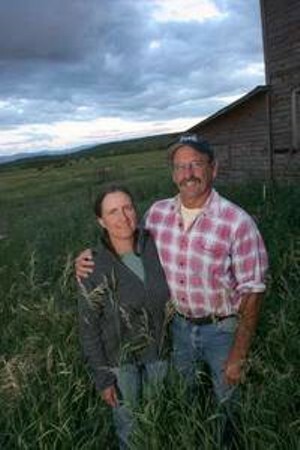 But at the time, most Vermonters had never heard of "community-supported agriculture;" in fact, several thought the Stevenses had invented the concept. It caught on quickly. "I think for a bunch of folks, it just resonated." He notes that some of the original 27 families that joined in the CSA's first year are still among its members. Laid-back, thoughtful, focused — many of the qualities that make Stevens a successful ag entrepreneur also serve him well in the political realm. But he was no neophyte when he first ran for the legislature in 2006. Stevens had been on the Shoreham planning commission and selectboard, spent five years as town moderator and served as president of Vermont Organic Farmers. In fact, he's been in and out of office since the fifth grade, when he did a stint on the student council in Pittsford, New York. "Mother was vice chair of the Monroe County Republican Party . . . it's in my genes, I guess," he says. Vermont's "citizen legislature" was part of what attracted him here in 1977 from upstate New York. In Vermont, "A person can be something if they want to," Stevens explains. "I can still work with Judy's support and blessing, hold down my day job and serve politically. Especially if I feel I have something to offer and the wherewithal to step up." Stevens got the idea of "stepping up" to the Statehouse at town meeting, when he heard Republican Rep. Mark Young of Orwell announce his planned retirement from politics. At the time, Stevens wasn't ready for a second career: He was studying mediation and conflict management at Woodbury College and had just agreed to teach a course on local food systems at Middlebury. Nobody ran for the seat, and Young ended up serving two more years. By the time that term ended, Stevens was ready. "It was essentially a two-year notice," he jokes. Though Stevens says "Vermont Republicanism" drew him here, he's always had an independent turn of mind. At the town level, he points out, he didn't have to pick a party affiliation. Once he decided to run for the legislature, though, "the Democrats were after me and Mark [Young] was after me to run as a Republican." He disappointed them both. "There was a little voice inside saying this was right . . . I wanted to run as a service and to represent my community," he says. "I felt like that could be best done as an Independent." As he puts it, "Independent, because interdependent doesn't work [on a ballot]." Stevens has long embraced the notion of interconnectedness. "I've always been more interested in community interests than personal rights," he muses. "When we look out for one another we're better than if we go it alone." But Progressive Rep. David Zuckerman of Burlington notes Stevens has a "streak of libertarianism." He knows the farmer well, and not just because he chairs the ag committee — he also apprenticed at Golden Russet. Stevens scolds consumers for giving up "the ability to decide for ourselves" about whether we want to buy raw milk or uninspected poultry. In his view, the government's paternalist approach fosters consumer apathy: "We're being told in the marketplace and in our political lives, 'Don't worry, we'll take care of you.'" What does Stevens see as the main challenges to Vermont food production over the next century? "Any discussion of a broader plan for farming has to take into account peak oil and an energy-limited future," he asserts. How will we cope? Stevens guesses that "There will be a more decentralized production model, smaller producers and in-state processing that can handle our production so we can use available energy to transport value-added products instead of commodities." The state has a significant role to play in addressing these concerns, and Stevens is proud of a recent bill he helped draft that takes up issues of meat production, dairying, food safety and energy conservation on farms. It authorizes mobile slaughterhouses, for example, and permits restaurants to buy chicken processed on the farm provided they label it as "un-inspected" on the menu. The House passed H.522 unanimously, and the guv signed it into law in May. One way to ensure success, Stevens believes, is "to not shut the door on the various forms of agriculture that could happen here in the state. Putting all our eggs in the commodity milk basket would do a disservice to those who are selling at farmers' markets" — and to folks who are raising awareness of Vermont's quality food around the country with their value-added products, such as highly touted artisan cheeses and ice cream. To that end, the first stated goal of H.522 is to "support programs and policies that foster the development of a diversified agricultural sector." How can consumers help? "The quickest way to a farming future is when people see that it's profitable to farm," Stevens says. In other words, buy local. When it comes to shopping, Stevens places the possible options in what he calls a "pecking order": "First, grow it yourself. If you can't do that, strike up a relationship with somebody close to home. From my perspective, somebody organic would be ideal. . . the last on the list would be blindly going into some supermarket and buying something just because it's cheap." At Golden Russet, the Stevenses sell 90 to 95 percent of their produce within 15 miles of the farm. To Stevens, that's an encouraging sign. "Whether or not agriculture makes a resurgence will, in part, depend on the community fabric and the importance people place on open and productive landscapes," he says, "and [on] the investment — beyond just a financial investment — that people are willing to make to support farmers. People really are voting with their dollars." Other commentators bear out this assessment — on a recent edition of Vermont Public Radio's "Switchboard," Allen Matthews of the Center for Sustainable Agriculture said Vermonters buy more food directly from farms than residents of any other state. But we can always do more. "There's a difference between choice and decision. Decision includes active information gathering," Stevens says, transforming effortlessly from garlic consultant into Statehouse orator. "You should be a participant, not just a consumer."